If you’re still creating on-call schedules by combining e-mails, faxes, phone calls, and voicemails into a word document or spreadsheet, then you know how costly this can be in terms of time, money, and resources. Simplify your physician on-call scheduling process today using our on-call scheduling software. Sharing schedule information online in real time ensures schedule accuracy and staff efficiency. Access on-call schedules with any Internet-connected computer, tablet, or smart phone. Notify staff of changes to the schedule immediately with one click. Track on-call scheduling and user profile changes with the History feature. Identify at a glance who, when, and what changes have been made. Pay for Call reports enable your accounting team to know instantly how many shifts and total hours each physician is working. Create facility-wide on-call schedules up to one year in advance for physicians, administrators, and employee groups. 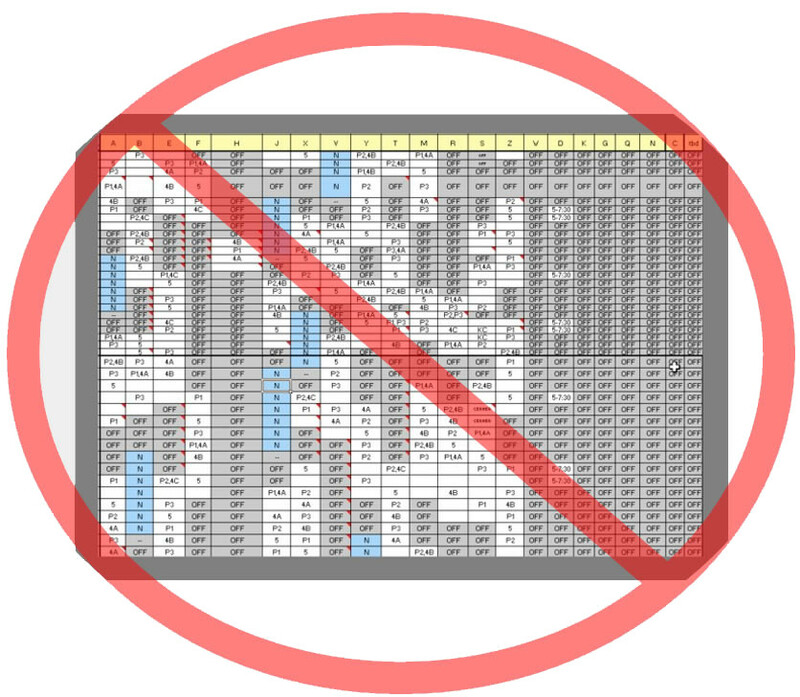 Physician on-call schedules saved indefinitely for EMTALA compliance. This type of call schedule is nearly impossible to keep in real-time, and due to its complexity, is also difficult to read. This can lead to errors in contacting the appropriate on-call physician at any given time. With a call schedule like the one above, all communication goes through a “Great Decoder.” This is usually one person or a small group of people who are tasked with managing the department and clinic call schedules. Emails, faxes, and voicemails are collected by this central person, who converts the schedule information into a single spreadsheet for the entire healthcare facility to view. Distribution of the schedules is usually fragmented, with each group having its own preferred method of receiving the most up-to-date information. This cumbersome process gives rise to frequent errors and miscommunication. Keeping up with faxes, phone calls, and handwritten notes, and tracking down the most accurate on-call information, distracts healthcare facility employees from efficiently doing their primary jobs. By eliminating these manual processes in favor of real-time, web-based automation, authorized staff can access and update the schedule at any time from inside or outside the facility. So whether employees are at their work stations, in a clinic, at home, or on the go, they can see the on-call schedules and make timely updates. This gives you the peace of mind that when a crisis happens, the on-call schedules will be accurate and accessible to physicians and other users as needed. 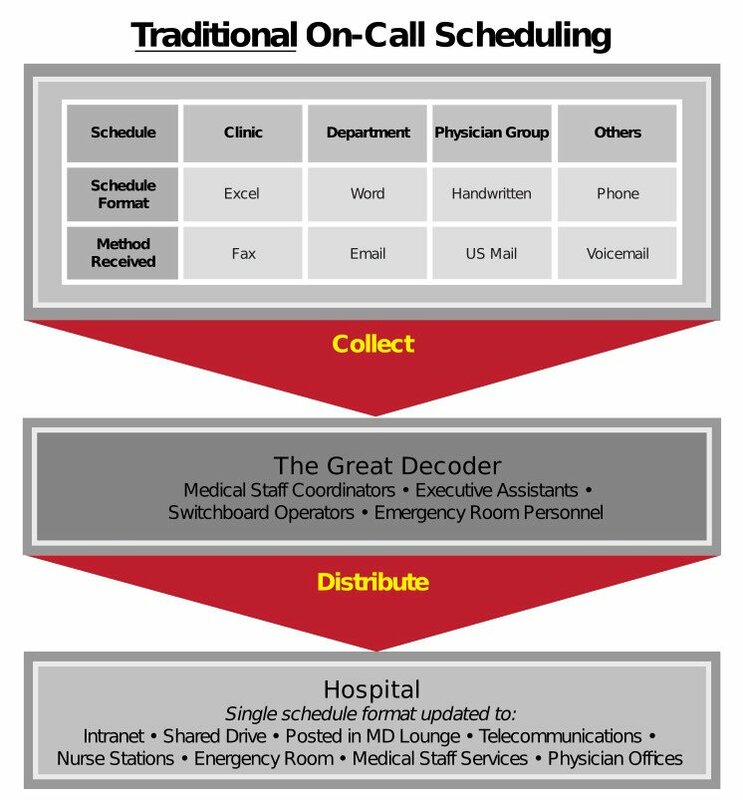 With MDsyncNET’s on-call scheduling software, instead of having one “Great Decoder,” each call group can be its own administrator and make schedule changes in real time. By decentralizing this process, many of our clients have gained improvements in productivity while boosting morale. Patients receive faster care when physician contact information is up-to-date and on-call schedules are in real-time. Enable your staff to connect with physicians faster and get patients the help they need with the least amount of time and effort. When a call is made to the wrong physician or not according to their call instructions, it can cause frustration for the doctor, and stress for the employee who may be reprimanded for the error. With a manually-updated scheduling process, these errors happen more frequently and undermine employee confidence in the schedules. Since MDsyncNET’s on-call scheduling software enables real-time updates, employees need not worry about the repercussions of an outdated schedule. When multiple departments within your facility print schedules every single day, related costs such as ink, paper, and wear and tear on copiers and fax machines quickly add up and affect your bottom line. Eliminate these unnecessary expenses with MDsyncNET’s on-call scheduling software. We have many satisfied customers. Here are a couple of short quotes explaining how MDsyncNET has helped them. 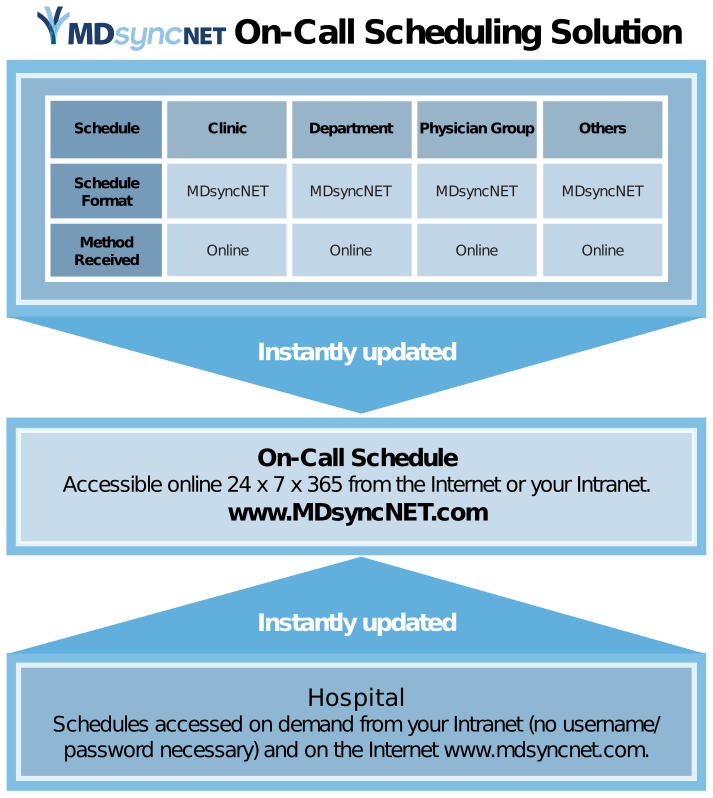 Visit MDsyncNET for your on-call scheduling software needs. If you’re still creating on-call schedules by combining e-mails, faxes, phone calls, and voicemails into a word document or spreadsheet, then you know how costly this can be in terms of time, money, and resources.